The ATP has announced the appointment of Chris Kermode as ATP Executive Chairman & President. 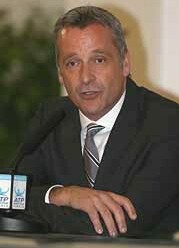 Kermode begins a three-year term at the helm of the ATP starting on 1 January 2014, and will be based in the ATP’s London office. Kermode has been involved in tennis for more than 30 years, first as a player, and then most recently serving as Tournament Director of the Aegon Championships at Queen’s Club, as well as Managing Director of the season-ending Barclays ATP World Tour Finals. Regarded as the ATP’s crown jewel, the tournament has welcomed more than 1.28m fans to The O2 arena in London over the past five years. Kermode’s wealth of knowledge of all facets of men’s professional tennis, as well as his vast experience working with all of the sport’s key stakeholders, made him a unanimous choice by the ATP Board of Directors. The appointment brings to a close a thorough search process undertaken by the ATP Board, with the assistance of executive search firm Heidrick & Struggles. Roger Federer, President of the ATP Player Council, said, "On behalf of the players, I am delighted to welcome Chris as our new ATP Executive Chairman & President. Chris has a lot of experience having worked in a number of different capacities in tennis over the years and he has all the attributes required to lead the ATP World Tour forward during this period of unprecedented popularity and success." Following his career as a professional player, Kermode worked as one of London’s top tennis coaches. He went on to work in both the film and music industries, starting his own promotion & events company, before returning to tennis. Kermode has served as Managing Director of the Barclays ATP World Tour Finals since 2008.